Parents and students fill the 1,020-seat auditorium at Williamstown High during a emergency Monroe Twp school board meeting in Williamstown, NJ on Oct. 9, 2017. Student in Williamstown, NJ will have the week off as the Monroe School District inspects buildings for mold. 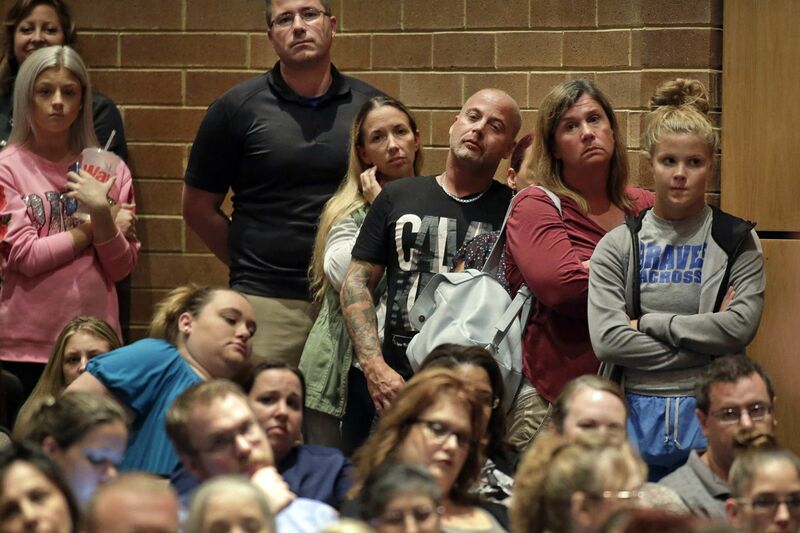 Sitting cross-legged in aisles and standing shoulder to shoulder against walls, hundreds of Monroe Township parents and students packed into Williamstown High School's theater for an emergency meeting Monday night prompted by the township school district's announcement that it was closing all of its schools for at least a week because of possible mold infestation. At the front of the room, people yelled at the school board members, saying their leadership was "deplorable" and "a disgrace." In the back rows, folks stood, booing and saying school officials didn't care about students' health. The contention had been brewing for days, and was worsened earlier Monday when it was announced that all schools would be closed for the week while inspectors test for mold. There are nearly 6,000 students in the district's four elementary schools, one middle school, and one high school. Holly Glen Elementary School was closed on Thursday after the district released a report from an environmental testing company that showed mold was detected on ceiling tiles, flooring, walls, lockers, desks, and toys. Students were temporarily reassigned to other schools for the clean-up. The school, which has 357 students in kindergarten to grade 4, is to remain closed at least three weeks. Just before the meeting began at 7 p.m., the theater was hushed, with parents exchanging stories of children's respiratory problems, ones they had thought were seasonal or run-of-the-mill illnesses. Now, they said, they aren't so sure. Professionals who had inspected the school and those working on clean-up tried to quell parents' worries. "It is a fixable problem," said Timothy Popp of TTI Environmental, which inspected Holly Glen. "I'm confident we can return your school back to a safe environment." School Superintendent Charles Earling speaks during an emergency meeting at Williamstown High. Superintendent Charles Earling said the situation was changing day to day, with students' well-being a priority. Officials said they would know more about the length of school closures later in the week. 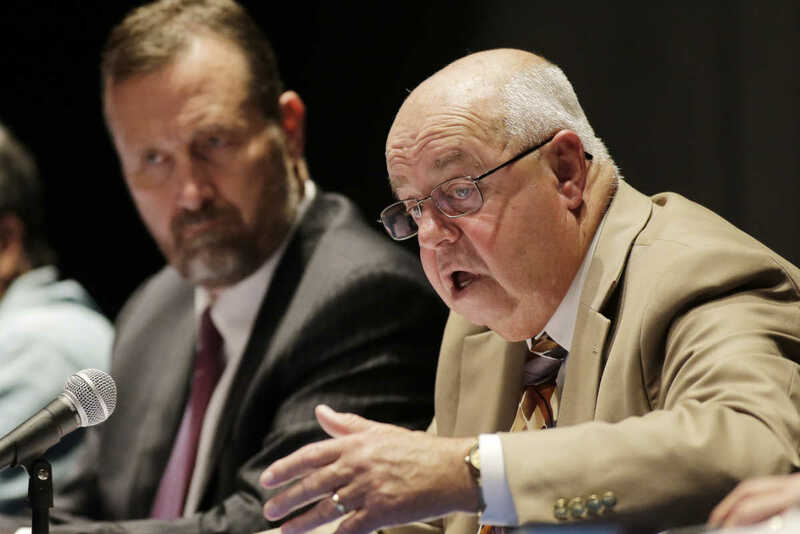 Earling also introduced an air quality task force, which was formed Monday morning by leaders of the district's unions and intends to focus on solutions. Township Mayor Daniel P. Teefy was the first to speak during the public comment section. "Stick together, stay calm. Worry about accusations and accountability later," Teefy told the crowd before addressing the board. But during much of the comment portion, it was clear many parents were concerned with accountability. The director of plant operations, David Sullivan, was called on to move from the public area and stand in front of the auditorium. Sullivan said he had known of the problem since January but had acted appropriately in calling in the health department three times. An antiquated air-conditioning system was likely a large contributor to the problem, Sullivan said. Officials said the vent system in Holly Glen had likely not been updated since the 1960s. Schools were already closed Monday for students because of Columbus Day; an in-service day for staff was canceled because of the air-quality testing. On Facebook earlier Monday, parents worried about making arrangements to take care of their children after the schools were abruptly closed. Nick DiFelice, who has a 9-year-old daughter and 6-year-old son at Radix Elementary, said his concern was, "How long has the administration known about this and how long have they not done anything about it?" He said his children have had respiratory problems. He wonders now if those are related to mold. Christina Capate, who taught first grade at Holly Glen two years ago, said she noticed problems then. "I had a dehumidifier in my classroom that I had to dump out at least twice a day," she said in an interview. "It held about 2.5 gallons, and normally you wouldn't have to do that unless you were in a very wet basement." Capate, who worked at the school for a year before leaving, said students would have asthma attacks in her class about twice a week. A statement from the Monroe Township Education Association and the Associate of Education Secretaries said the two organizations had documented a mold problem at Holly Glen for the last five years. "It may seem as the district is moving swiftly, but they are attempting to correct a five-year-old problem in five months," the statement read. "Had the district responded appropriately then, there would be no crisis now." Some parents had created a petition calling for the removal of Earling, as well as staff members Sullivan and Ralph Ross, saying they had known of the mold's existence in the schools "for an extended amount of time" and ignored requests for the mold to be tested. The petition had more than 1,300 signatures late Monday afternoon. There was also concern Friday when parents of children who attended Williamstown Middle School learned mold was found on ceiling tiles in that building. Michael Keller, an industrial hygienist and indoor air quality consultant, said Monday it was unusual for a possible mold problem to shut down an entire district. Mold can develop when the relative humidity exceeds about 60 percent, Keller said. A single mold spore in a damp place — fed by sources needed to grow, such as dust, paper, hair, fiber and wood — can spur mold growth, he said. "They have to find out what caused the problem, not just that there's a problem," said Keller, a member of the Indoor Air Quality Association's chapter in Trenton. He is not involved in the remediation. Mold of various species is common indoors and out, according to the Centers for Disease Control and Prevention. Two of the most frequently found indoor molds — Aspergillus and Cladosporium — were identified by a consulting firm that examined Holly Glenn as the most common there as well. "Most people breathe in Aspergillus spores every day without getting sick. However, people with weakened immune systems or lung diseases are at a higher risk of developing health problems due to Aspergillus," the CDC says on its website. Those problems "include allergic reactions, lung infections, and infections in other organs." Inflammation can particularly affect children with asthma. The Environmental Protection Agency publishes a booklet to help school officials manage asthma, which can be triggered by mold as well as roaches, dust mites, and other factors. Old, damp buildings such as schools are ideal places for mold to grow. The Cheltenham School District in Montgomery County, among the wealthiest in the region, fought a decades-long battle with mold at Cedarbrook Middle School. The school board finally gave up shortly before Christmas 2013, and voted to close the school and relocate its 750 students. Closing the entire district as a precaution while determining the extent of the mold "is probably as reasonable as taking a couple of snow days," James Palmer, chief of rhinology for Penn Medicine, said. "The reason you take off for a snow day is so the school bus isn't in a wreck." For children with asthma, mold can cause runny or watery eyes, oozing, and nasal obstruction. "If parents are seeing asthmatic-type symptoms in their kids that are new since school started, I would get them looked at," Palmer said, "but I wouldn't be overly alarmed." Staff writer Don Sapatkin contributed to this article.